See our most recent performance photos. Founded in 1985, the 79th NYVI Highlanders Living History Association (of Colorado) is patterned after the 79th New York Volunteer Infantry (NYVI) "Highlanders". Which was formed in 1859 with Scottish immigrants and was mustered in Federal service from 1861-1895. The Regiment was engaged in 14 major battles from the first Battle of Bull Run (Manassas) to Appomattox Court House. The 79th is seeking recruits! Dues are currently $35 a year ($50 for a family). For information, please contact Jim Campbell via email to Jim Campbell or via phone at 303-243-0300. See our Facebook page! Lots of great information. The pipe band generally meets weekly for practice on Sundays at the Kiowa Masonic Lodge (except in the Summer, when we meet on Thursday evenings in Cherry Valley). We have four members in the Calhan area, five in Elizabeth, plus members from Louisville and Thornton, Evergreen, Aurora and Denver down to Colorado Springs. Kiowa is sort of in the middle! We perform around twice or three times a month, during the warmer months (March through October). We can be seen performing at events both large and small, including the Elizabeth Celtic Festival, the Colorado Scottish Festival when it was at Highlands Ranch, and, at one time, the Longs Peak Scottish Irish Festival. However, we do also especially enjoy supporting the Calhan Loyalty Day Parade and the Sedalia St. Patrick's Day Parade—both great small events. We feel that there are several local events that deserve the support, and we strive to give it. In 2010, the band purchased new kilts in the Cameron of Erracht Tartan, which is the same tartan worn by the Civil War era 79th New York Highlanders. (Prior to that, we had Black Stewart tartan.) 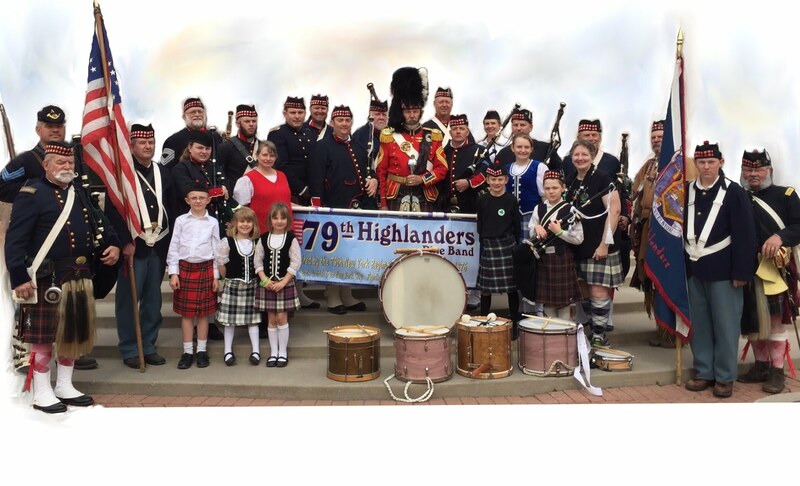 Our goal is to create a pipe band that is uniformed like the original 79th. Because there is some doubt about the existence of a pipe band associated with the regiment in 1861, we say that we are a group "inspired by" the 79th New York Infantry Regiment (Highlanders), not that we are "portraying" the regiment in every way. We do make the history of the regiment a critical part of what we communicate. We've just completed the 150th anniversary of the American Civil War. We want to promote the learning and understanding of the history of the American Civil War and the role of the Scots and Irish immigrants in the whole of the American experience. In Colorado, Scots and Irish immigrants (and people whose ancestors came from Scotland and Ireland), made their mark here as Mountain Men, Cattlemen, town-builders and teachers. Some were named Cameron. Our organization has supported local historical preservation groups, by performing at their significant events. There are several other great Living History organizations in other parts of the U.S. and in other parts of the world also portraying this remarkable regiment from the American Civil War. Please see the Civil War links page. The original regiment that inspires our organization was The 79th New York Highlanders, a regiment formed in 1859 in New York City, just before the beginning of the American Civil War (1861-1865). It was brought about under the auspices of the Caledonian Society of New York, and with the encouragement of the British Consul of New York, Captain David Cameron. Capt. Cameron had been an officer in the 79th Cameron Highlanders of the British Army; so, when the number "79" was available for a New York regiment, he recommended that they pattern a regiment after the Cameron Highlanders. Before the war, the regiment had four "kilted" companies, amounting to around 260 men, all told. Besides drilling as a militia regiment (equal to our national guard now), the 79th Highlanders provided a contingent of soldiers for visiting dignitaries and special events. They were part of a review for the Prince of Wales, as well as welcoming the Japanese ambassador. They were sometimes known as the Seventy-ninth Militia; the Highlanders; the Cameron Rifle Highlanders; the Highland Guard; and the Bannockburn* Battalion. With the firing on Fort Sumter and the immediate threat to the nation's capital, the Regiment "volunteered to a man" to answer President Lincoln's call for 75,000 men to restore order and the rule of law. First, however, they needed to meet war department "manning standards" and had to recruit up to wartime levels. That meant that four companies would not be enough: they had to have ten companies. What had been a regiment of mostly Scottish immigrants, now had a large Irish contingent, and anyone else who wanted to join. While the first four companies were kilted, it was decided to have the next four companies in tartan trews (pants made of kilt material), since the available tartan "yardage" would make a lot more pants than kilts. 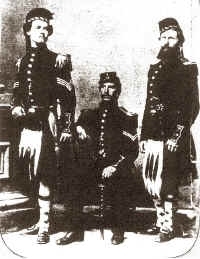 The remaining two companies wore the light blue pants common to Union Army regiments, although the coat was similar to the other companies. Their first battle was Bull Run, and they were under the brigade command of (then) Colonel William T. Sherman (later the famous General). In that battle, they fought well and suffered much...in fact, their regimental commander, Col. James Cameron (brother of the Secretary of War), was killed and the regiment suffered the most casualties of any Union Army regiment, and was the last to leave the field, covering the Army's retreat. They were considered one of the best regiments in the Civil War, of either side. The Highlanders fought in seventeen major battles, plus a score of smaller engagements. These included, besides Bull Run (Manasses, VA), Secessionville, Chantilly, 2nd Bull Run, Antietam, Fredericksburg, Vicksburg, Knoxville, the Wilderness, Spottsylvania, Cold Harbor, Petersburg and Appomattox. Over the course of the war, the Highlanders would lose 502 men, killed, wounded or missing. They would also earn the reputation as one of the hardest fighting regiments in the army. This was even acknowledged by their enemies: As the Charleston Mercury Newspaper said, "Thank God Lincoln only has one 79th Regiment." *At the Battle of Bannockburn, in 1314, Scottish King Robert the Bruce led his smaller army in an astounding victory over the larger and better equipped English Army under King Edward III, which gained for Scotland its independence.